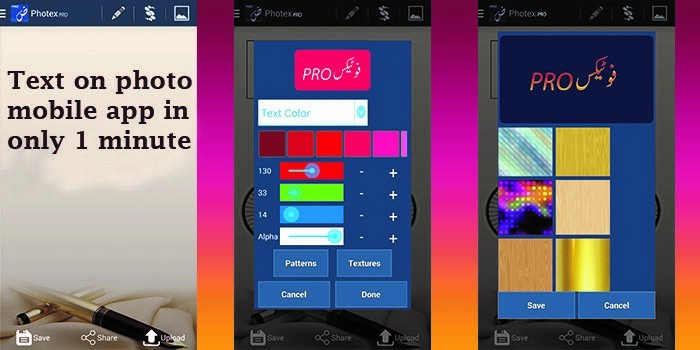 A mobile application designed to combine photos and text for sharing; Photex Pro has been launched in the app industry. 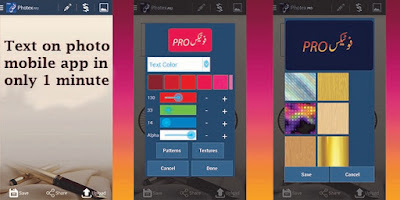 The application possesses a variety of features to aid the user in simple graphic design. Even those with little to no understanding of designing can use this application. It provides the users with simple user-friendly methods to design their own posts and adding text to their photographs. With the features and conveniences Photex Pro offers, it covers wide areas of social media where users need to post. Apart from designing and photo editing it also aids in advertisements. The easy-to-use, yet technically advanced application possesses a wide variety of features. Photex is actually an amalgamation of Photo and Text. So it offers its users an array of options for both Photo and Text. With over 300 font types the application covers a number of languages and their fonts. The fonts and languages vary from Urdu and Hindi to Arabic and English and many more. Alongside it provides options for text color with gradients, patterns and textures. In addition it also allows for text placement and auto wrapping. Keeping in touch with the current fad of pasting emoticons and stickers to photographs the application comes with built-in as well as downloadable stickers. The stickers themselves can be edited and positioned to the user’s requirements. The application also features cropping tools to crop the images as per our requirement. The app itself provides a wide variety of backgrounds. Apart from the sizeable template collection it also allows the user to create collages using a number of photographs and images. The options for using and compositing stickers, backgrounds and images are numerous. After composition and editing the photographs and images can then also be uploaded and shared. Phtoex Pro helps the user design posts for Islamic events. With its font, color and designing options the application allows for posting content relating to Ahadith and even Arabic Quranic verses. The Arabic font offered by the app helps conserve the originality of the verse and Ahadith. The application aids in the creation of poetry posts to share with friends on social media. It also offers features that aid in creating love letters. The options also provide for creating invitation cards and greeting cards for different occasions. It even allows the user to create their own customized signatures. With the styling and designing options the application can create regular wallpapers as well as live wallpapers. Advertisement creations through graphic designing can be accomplished fairly easily through this application. Using different languages, fonts, colors of their choice, images and collages the user can composite billboards and other picture advertisements for ad campaigns. Even the ad campaigns can be aided using the Photex Pro application. Through the posting and sharing options on the app the user can launch their own ad campaign on social media.